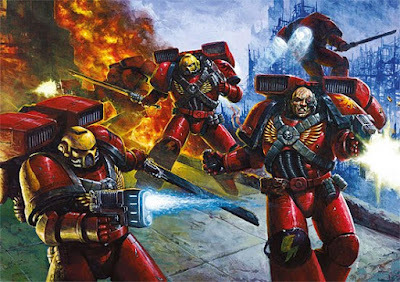 This April the Blood Angels will be re-launched with an all-new Codex and range of plastic and metal miniatures. One of the oldest and noblest of all Space Marine Chapters, the Blood Angels have stood fast against the enemies of the Imperium since the Great Crusade and it was their Primarch Sanguinius, who laid down his life to aid the Emperor against Horus in the final hours of the Warmaster’s rebellion. The new Codex explores the background and history of these superhuman warriors like never before, and contains new artwork depicting some of their greatest battles and most powerful champions. The Blood Angels have always been a powerful close combat army and have been made even deadlier thanks to a range of specialist wargear, the ability to field Assault Squads as Troops choices, and more Dreadnoughts than any other Space Marine Chapter, including a Death Company Dreadnought and the fabled Furioso Dreadnought. The Sons of Sanguinius will be deep striking onto a tabletop near you this April – now’s the time to practice painting red.